With good looks, the upgraded 2014 Mercedes E250 Coupe was a real head turner when it arrived at our Carz Makeover Workshop today for grooming with the ZeTough Paint Protection treatment. The new E250 Coupe has sophistication, luxury and class with new headlight design, more stylish body, new engine and host of latest tech-gears. A standard safety device called, “ATTENTION ASSIST” system even alerts the driver if he feels drowsy at the wheel. A “Time to Rest” with a coffee cup icon flashes in the instrument cluster. The upgraded 2014 Mercedes E250 Coupe delivers a sweeping roofline, sleeker grille, new headlamps and more aggressive bumpers. Despite the front guards and bonnet remains unchanged, Mercedes designers gave the E250 coupe a new face with a fresh bumper, headlights and grille design. Sleek, long life LED headlamps and daytime running lights. Under the hood beholds the 2.0 litre, four cylinder turbo engine, 155W/350Nm mating the 7-speed automatic transmission. Heated exterior mirror electrically adjustable from inside, painted in Polar white body color. The luxury interior of the E250 features Nappa leather-wrapped steering wheel and Bangal Red interior. The rear view of the upgraded E250 Coupe with new wrapped-around LED tail-lamps and Mercedes badge. 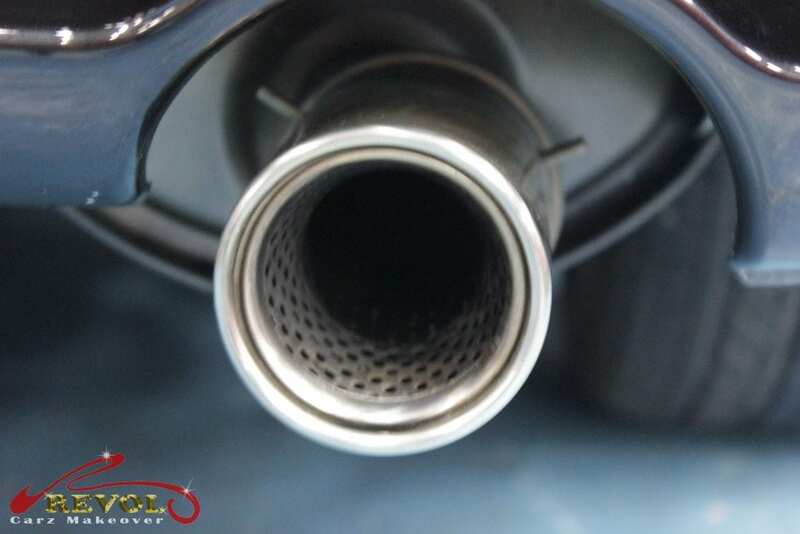 The twin exhaust pipes on the E250 Coupe are subtle yet sporty design. The Mercedes E250 Coupe’s standard 18-inch sports alloy wheels. The Mercedes E250 Coupe is a fine and elegant cruiser that exudes class, comfort and respect on the road. After ZeTough Ceramic Paint Protection coating treatment, the car will be more a head-tuner as it cruises down the roads. “ONE OF 100” CELEBRATION MASERATI QUATTROPORTE “COLLEZIONE CENTO” ZEGNA LIMITED EDITION! In celebration of its 100th anniversary, Maserati teamed up with the world’s renowned Italian fashion designer company, Ermenegildo Zegna to produce just 100 units of the limited special edition model, the Maserati Quattroporte “Collezione Cento” super deluxe luxury sedan. Exclusive to the 100 limited edition, the Quattroporte’s exterior paintwork feature special Platinum-Silk with aluminum pigments. It was rewarding for us in joining the celebration to treat the unique 88/100 Maserati Quattroporte Collezion Cento at Revol Carz Makeover workshop, to groom and protect the unique paintwork adequately with ZeTough Ceramic Paint Protection. Under the bonnet, the twin-turbo 400 horsepower, 4.2 litre 524lb/ft torque, V8 engine, paired with hydraulic automatic 6-speed transmission is able to bolt from 0 to 100 km/h in 4.7 seconds. The 88/100 Maserati Quattroporte Limited Edition featuring unique Platinum-Silk and ultra fine aluminum pigments. A closer look at the exterior of the Quattroporte Ermenegildo Zegna’s fine luster with a soft sheen to the finish. 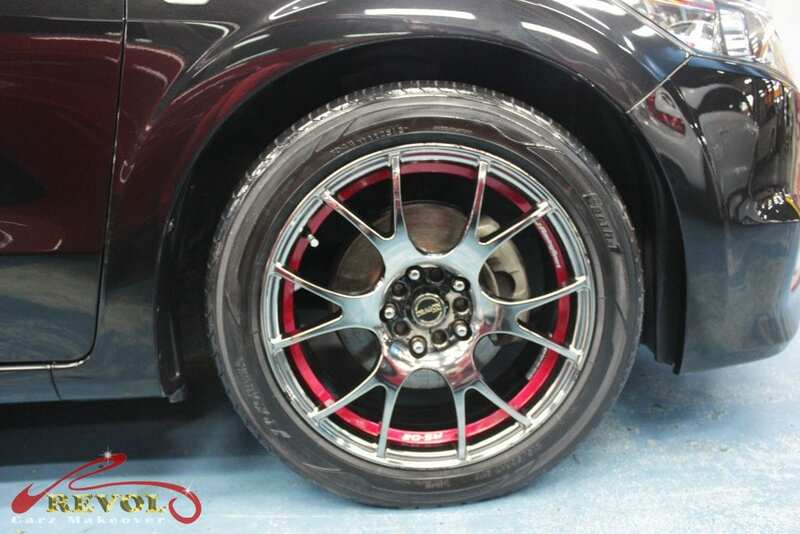 The same finish is applied to the 20-inch Mercurio alloy wheels. The front lights stand out with captivating design. The 4.2 litre special edition Quattroporte is equipped with twin-turbo 400 horsepower, 524lb/ft torque, V8 engine. The Italian stallion can bolt from 0 to 100 km/h in 4.7 seconds. The extravagance of luxurious interior boasts of Zegna designer’s touch in warm colors and fine walnut wood trims. The rear seat passengers are presented with multimedia entertainment system music enjoyment like making phone calls, browse internet and sending emails via keypad built into the armrest. The interior is exquisite, fitted with “Poltrona Frau Cuoio” tan leather. Maserati produced only 100 of the Quattroporte Ermenegildo Zegna Limited Edition with “Quattroporte” affixed to the dashboard. The “Collezione Cento Limited Edition 088/100” badge is proudly engraved steel plate on the walnut dashboard. This is, exclusively, the 088th of 100 cars Limited Edition in the whole world. The analog classic clock lends a touch of class on the dashboard between the blower vents. The rear end of the Maserati “Collezione Cento’s” innate elegance with the twin oval exhaust pipes poised with the triangular looks of the tail-lights. Sports twin oval exhausts with pneumatic for aural delight. Soft luster finish is applied to the 20-inch Mercurio Alloy Wheels. Grooming the 88th of 100 Limited Edition Maserati Quattroporte “Collezione Cento” Zegna was indeed a rare experience and excitement for our team. The happy owner has a peace of mind that his Special Edition Maserati’s paintwork will enjoy long-term protection by ZeTough Ceramic paint protection coating. We hope you had a great new year celebration. ” I would like to show my appreciation to Marcus and Revol Carz Makeover Team for doing up such a wonderful spray painting on my Honda stream. The job done exceeded my expectation and I am glad to choose you guys for my spray painting with ZeTough paint protection services. I really like the effort of ensuring all the interior area such as the engine compartment and leather seats are thoroughly cleaned up which revive back my lost new car feel! You guys really deserve the praise! Revol Carz Makeover management would like to express our appreciation and thanks for Mr. Shaharin’s testimonial. The headlamp is clearly more refreshed now! A well polished rims then will only completed the New Showroom feel too!